Lawrence Schofield is one of only 2,000 students in England to get 9s in English, English literature and maths, the top possible in the new system. Overall, just under 50,000 9s were awarded to candidates - but only 2,000 students scored a clean sweep of 9s in English, English literature and maths. At the top, in the new GCSEs there are now three grades - 7, 8 and 9 - compared with two under the old system. A* results are now split into 8s and 9s. So, a lower proportion of candidates have achieved a 9 than gained A*s under the traditional A*-G grading system. Boys did better in maths. The new grading system is being rolled out as new GCSEs in other subjects are brought in over the next two years. 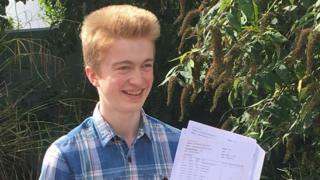 Lawrence says he was "amazingly lucky" to attend Tanbridge House School in Horsham, West Sussex, but as it only goes up to age 16 he will move on to the local sixth-form college for A-levels in double maths, physics and chemistry. The aim of the new grading system, which currently only applies to these three key subjects, is to allow more differentiation between the brightest candidates. It is also part of the government's strategy to make GCSEs more rigorous and challenging. But Andrew Halls, head master of the private King's College, Wimbledon, where half the Year 11s achieved 10 or more top grade results, warned against a pursuit of perfection at GCSE. He said: "There is misplaced anxiety about the new grade 9s in GCSEs. "I am hopeful these will be rare enough to help teach our pupils an essential lesson in life: perfection should never be our incentive in life. "We need to understand that human beings and human achievements are flawed. "Exam results are very important but they are not the sole purpose of education, nor the final means of assessing the value of a child." Even high-flying Lawrence says that when he was doing the exams he tried not to think about the results. "You have to try not to panic because it allows you to be more creative during the exam. "You just do your best and stay positive," he says. "It might flow or it might completely fall apart." He says that when the exams were over he completely put them out of his head until results day. "What's done is done," he says.